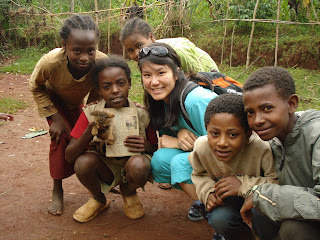 Ethiopia 2010: This is Africa. It has been a week since we got back from Ethiopia. Right before we left, we had an “Ubuntu”, or gathering, and we discussed some issues we could face as we came back to America. Assimilators were people who, upon return to the US, could easily get back into the swing of things. Alienators would feel guilty about a lot of things, like spending $20 on a new shirt when that money could probably feed a person for 20 days in Ethiopia. Integrators were the best to be – they would take what they learned abroad and somehow “integrate” it into their daily lives here in the States. To tell you the truth, I didn’t really know what being an Integrator meant. Typically, I’ve always been an Alienator. I had a fantastic trip to Ethiopia, but there were several emotions that I felt the last few days before I left and the first few days back in Texas. But first, a set of questions. Did we understand healthcare in a third-world country better? Yes. We shadowed several doctors/surgeons at many clinics and hospitals. Not only were we lucky to get in contact with these very busy care providers, they were extremely compassionate and informative, and they gave us a startling awakening into their access to healthcare – a very dismal picture compared to what is offered to us as Americans. Did we set out what we accomplished to do? Yes. We had five clinic days in which we met with over 400 patients. Some of them had never seen a doctor before and Dr. Usatine was their first chance, ever. Did we live simply during our time there? I believe so. We didn’t have electricity some nights and took cold showers several other times (we were just thankful it was clean). We ate without that full, satisfying feeling we are so use to experiencing, but we were grateful for the food we were given. Did we get a good grasp of family life in Ethiopia? Yes. Our maternal health survey allowed a 3 day window into the lives of some very precious mothers, their children, and their homes. I had a very heavy heart leaving Ethiopia. I felt that in spite of living the way Ethiopians lived for three short weeks, at the end of the trip, this would not be the final reality for me. At the end, I was sent back on a gigantic plane, only to have my car, washing machine, hot water/tub, and warm bed to greet me. My fridge will always be stocked full of food and I won’t think twice about my electricity or my clean water. 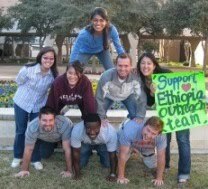 Sadly, the people I met in Ethiopia, many that I had gotten to know and love, will stay where they are. Their lack of access to clean water will continue to create a host of diseases that will attack their bodies, while their lack of basic healthcare will continue to leave them mostly defenseless. My final thought as I left Ethiopia was this: Why were we blessed to have so much while so many in the world have so little? While I am still working out the details of this thought, I have come to one conclusion that I am sure of: Even though I have personally been given so many wonderful blessings in my life, I have also been given a responsibility to not take these blessings lightly. As a citizen of this world whose actions can greatly change the lives of others, it is my duty not only as a medical student but more importantly, as a human being, to help my neighbors here and abroad. One quick, but shining story during this trip that I completely attribute to the power of God’s timing is the story of Abraham. He was a 10 year old child who was kicked out of his home when he was 6; when his mother had died, his new stepmom did not favor him. He spent the last 4 years working at a teahouse in exchange for food and shelter and a week before we arrived in Aleta Wondo, he fell ill and was thrown out to fend for himself. He eventually heard that foreigners had come into town on a medical trip, so he found us during out week of clinics. We found Abraham lying in a patch of grass outside our clinic with a fever of 106.7 F. After quick action on the part of our team and the healthcare staff at the clinic, we were able to get his fever down. On the last day of clinic, he was healthy enough to be released from the hospital. Abraham is currently being adopted by Common River where he will never have to worry about food or shelter and will be attending school in the Fall. Though much of our work in the clinics and medications only provided temporary relief, we did make some permanent footprints. We provided quality care to a population where most had never seen a doctor before or had anyone really listen to their clinical ailments. We helped conduct a survey that will hopefully branch into maternal programs for women in Aleta Wondo. And lastly, we helped a young boy get a second chance at life. There is much I would like to say, but to be brief, this trip was nothing short than incredibly life-changing. As a future physician, I can say that my passion for medicine has not only increased exponentially, but the faces of our patients we saw will drive me to work harder and better for the patients I will see in the future. In addition, I have not only been completely humbled by my time in Africa, but am hopeful to the future as I have seen the compassion for the needy in both my teammates as well as the very competent and caring doctors in Ethiopia. Needless to say, it will not be my last time to be in Africa.